Recently I gave my wife a birthday gift, a WW1 MKVII, Verner's Pattern prismatic compass" that was produced in 1916 by Cruchon & Emons London. The compass has a mother-of-pearl dial with the orange direction arrow, which was useful for low light reading. The brass lid has a black finish and hinge as well as a brass knob on the side for transit locking of dial. The compass also includes a magnifying lens for precise angles calculation for accurate target engagement. In this essay, I will reveal the cultural biography of the Verner's Pattern Military Marching Compass, analyzing its "commodity situation" that is, its exchangeability in its past, present and future life as a culturally constructed social object. By following its trajectory as a cultural item, from its production to its status as a commodity for exchange and distribution, and its subsequent uses throughout its social history, I will show how this cultural object moves in and out of commodity phases based on its socially relevant qualities. Working with Appadurai's (1986) notion that a commodity is "anything intended for exchange," the social life of the Verner's Pattern military marching compass begins with its inception as a "commodity by destination," meaning it was intended by the producer, Cruchon & Emons London, to be exchanged by sale to the British military (Appadurai 1986:16). This is aptly described as the "commodity phase," whereby the cultural object enters into a state of being a commodity—compasses are produced, then sold to the British Army, who then distribute them to British officers in exchange for their services in the Great War of 1914-1918 (Appadurai 1986:13). An important aspect of the Great War was the deployment of troops into unfamiliar territories, thus it was necessary to train British officers in map reading and the use of the prismatic compass for day and night marching (Whitehouse 1915:187). Therefore, these compasses would be classified as a "primary commodity," rendering them a necessity rather than a luxury (Appadurai 1986:16). Reliable, well-made, easy-to-carry pocket compasses were needed to meet the demands of Infantry Battalions, Royal Army Medical Corps, Army Service Corps, and Royal Engineers' Signal Company (Whitehouse 1915:185). Thus, compass manufacturers made it possible for British officers to successfully direct troop movements during WWI and provide accurate target engagement (Takacs 2010:73). These social arenas define the "commodity context" of our cultural object and highlights links to the "commodity candidacy" of our cultural object, meaning the factors that define its exchangeability in any given social and historical framework—the utilitarian function of the Verner's Pattern prismatic compass as a lightweight, simple-to-use navigational/survey instrument (Appadurai 1986:14). As the Great War came to an end, these compasses, no longer needed as an instrument for navigating the obstacles of war, were taken home, back to civilian life where one could only surmise that they were tucked away in a bottom drawer as "ex-commodities," relegated to the category of sentimental cultural objects and reminders of past service in the Great War (Appadurai 1986:16). This might just as well have been the epitaph of our object's social history, but to the contrary, even though WWI compasses remained out of circulation for decades, they have reappeared, their commodity candidacy reframed by North Americans from various social classes who became interested in collecting cultural objects of recent vintage known as "collectibles." Collecting has been defined as, "the acquisition of large numbers of objects belonging to particular categories, without utilitarian need for such objects and sometimes at a heavy cost in money or labor" (Rubel & Rosman 2001:316). This signified a new commodity phase in the social history of our cultural object. Their relevance as commodities, that is their commodity candidacy, had changed from its initial utilitarian value as a navigational/survey instrument to that of something else—"the collectible." This shift in the commodity candidacy from the intended use as a military compass to something else is termed "commodity by metamorphosis" (Appadurai 1986:16). Furthermore, our cultural object has changed from being a primary commodity—that is, an object of necessity to that of a secondary commodity—a luxury item (Appaduari 1986:16). To explain how the WWI Verner's Pattern prismatic compass has come to exist as a commodity in this phase of its social history requires an understanding as to why collectors desire to buy, sell and trade specific cultural objects from the past, which have been removed from general circulation. Collectors exhibit an obsessive tension between a passionate, non-rational attachment to the objects they collect and a very practical, almost scientific and rational approach to obtaining, categorizing and valuing their collectibles (Rubel & Rosman 2001:319). Collecting not only entails a great deal of personal satisfaction to the collector, it also contributes to shaping a collector's identity. Collectibles take on an almost mystical, sacred quality. This is illustrated by the almost myth-making provenance in which the collector tells and retells the story of a particular collectible or collection and how it was obtained, thus merging the collector's own collecting experience with history of the collectible. The collection takes on a life and history of its own, and plays a significant role in the trajectory of the collector's own life and identity (Rubel &Rosman 2001:319). In addition to identity construction, the commodity candidacy or "regimes of value" (Appaduari 1986:15) for collecting particular cultural objects also include, financial, social, nostalgic and cultural preservation. For some collectors its the social aspects, establishing connections with other collectors where collectibles change hands either for cash or barter in an organized social system of garage sales, swap meets, antique shops and shows, collector conventions, auctions and museums (Rubel & Rosman 2001:320). Financial profit or investment also plays a part in the world of collectibles. Dealers not only validate the specific cultural objects as collectibles, they also provide assurance as to the authenticity and establishment of value based on supply and demand. Many dealers were originally collectors. Sometimes to improve the quality of their collections, collectors would commence the business of selling and trading duplicate items or pieces of lesser value to acquire more desirable items for their collections (Rubel & Rosman 2001: 323). Cultural objects from the past hold certain nostalgia, evoking personal memories and experiences of a past time and place in one's childhood (Combs 2003:45). In an email correspondence, Chris Cole, who does not deal, but only collects compasses explained: "I got seriously interested in 2004 when I bought a Singers Patent compass and the two things that made me collect more was: who was Singer, and the fact that, in my childhood, maps and compasses had been a big part of growing up. It was primarily through researching Singer and finding out who he was that I made contact with Kornelia Takacs, author of the Compass Chronicles and several other compass collectors" (Cole email to author February 16, 2014). Compass collecting has a cross-category appeal to collectors of military items, scientific instruments and even includes people who collect pocket-watches. As a vintage cultural object, these compasses not only signify a great deal of information about the past, they also hold important social and cultural transitions and convey a historical origin, style and craftsmanship (Combs 2003:52). Mohamad Khaled Allouche, who is not only a compass collector, but also an online dealer says, "My interest in compasses started when I was five. It was really a magical instrument for me. Later I became interested in mechanical watches. Compasses and watches are both about Time and Space. A compass or a watch is simply a humble instrument that allows us to position ourselves in time or in space. They are also an opportunity for us to make a link between these two elements, since history is associated with a location in space. Each of these instruments has its own history across different places" (http://www.borealarrow.com/AboutUs.htm). Many collectors are also cultural preservationists—purveyors of material culture who, in addition to collecting various types of compasses, will also accumulate all sorts of pertinent information to identify various kinds of compasses and expound the histories of compass makers, models and types. The Compassipedia is an online compass museum that provides vast library of historical, technical and cultural information about all sorts of compasses. They also have an online compass shop (http://compassmuseum.com). Some collectors, like Chris Cole, do not trade or sell items from their compass collection. Their collections are removed from circulation and deemed "ex-commodities." The commodity context or various social arenas, in which these compasses are bought, sold and traded, link their regimes of value to the commodity phase of its social history (Appadurai 1986:15). How compasses as commodities move about the marketplace vary from garage sales to flea markets to antique stores to swap meets, collection conventions and online websites, where bargaining and haggling on price is usually present. In what Appadurai (1986:21) defines as "tournaments of value"—periodic events whereby commodities, like compasses, can be acquired in specialized arenas such as, the online auction site ebay.com, where bidders compete with one another for an item's acquisition. In a sensational tournament of value, a Verner's Pattern prismatic compass that was supposedly used by Lawrence of Arabia in WWI was sold to an anonymous telephone bidder for £250,000 in 2006 by the Christie's auction house. However, issues concerning the authenticity of the item's provenance were raised when experts said Christie's was duped and the successful bidder acquired a £50 fake (http://www.standard.co.uk/news/lawrence-of-arabias-14m-compass-is-a-50-fake-7285211.html). This article exemplifies the significance and the problems of authenticity, expertise and evaluation of specific commodities and their subsequent effect on the status, value movement in the marketplace. I began this essay with the purchase of a compass for my wife's birthday to illustrate not only how a cultural object moves about and is transacted in the marketplace, but also to show how it acquires a cultural biography throughout is social history. Therefore, I will conclude this essay with a brief analysis of how, after appropriating the compass via an online transaction with a compass dealer, I successfully converted its status from a relatively anonymous commodity, a compass, into a highly personal gift. As part of an enduring social relationship, cultural objects that are to be exchanged in a personal way are typically transacted as presents in either a public ceremony such as Administrative Professional's Day or in a private ceremonial occasion, such as my wife's birthday (Carrier 1990:580). The object transacted infuses the relationship dialectically with its own identity, meaning, that an object is not a neutral thing, but a culturally constructed item, assigned with particular meanings and organized into a certain cultural category, such as a gift or present. Furthermore, for the gift to be considered personal, it needs to reflect the identity of the giver—that is, it must convey that it is an extension of the giver's self, something distinct from merely being classified as the property of the giver (Carrier 1990:581). Furthermore, whoever the intended recipient of the gift is (spouse, friend, co-worker, etc. ), will determine the extent of the giver's possession endowed in the gift. For example, a token of appreciation from a seller to a long-term customer may be more of a commodity, whereas a birthday gift to one's wife would require a much higher degree of possession of the giving spouse (Carrier 1990:582). My wife loves the book and the movie, "Out of Africa." Recently we watched the film again on the big screen. She was especially touched by Denys' gift of his personal compass to his friend and later companion, Karen Blixen, who was lost in the Kenyan wilderness while trying to get supplies to the her husband, Bror, who was on the front during WWI (Out of Africa 1985:). Later in the movie, Karen is returning home to Denmark and presents the compass as a gift to her long friend and servant, Farah, so that one day he may find his way her again. 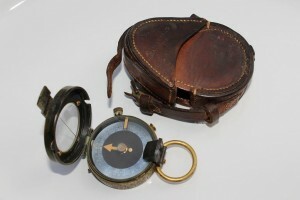 So for my wife's birthday, I found a WWI Verner's Pattern prismatic military marching compass for sale online, circa 1916, (about the same year Denys gave his compass to Karen so she could always find her way). Before I presented the compass to my wife, I teed up the scene from the movie "Out of Africa", in which Denys hands Karen his compass. I paused the scene and presented my wife with a homemade birthday card with a cut-and-pasted screen-shot of the same scene—that of Denys handing Karen his compass (with a personalized note inside). I then presented the compass as a wrapped gift, so when my wife opened it her reaction was overwhelmingly emotional and highly appreciative of such a thoughtful and personal gift. In my analysis of this gift exchange, it is important to note that in capitalistic societies, commodities are fundamentally impersonal objects. There is a separation of things and people because cultural objects are mass-produced by an anonymous labour force, thus the object has no personal maker (Carrier 1990:582). In order to convert the anonymous commodity into a personal possession, the giver must initiate the work of appropriation, which has several different modes of demonstrating and infusing the commodity with the giver's personal possession (Carrier 1990:583). Ceremony is one way in which the gift acquires personal possession. For example, I presented the gift as a wrapped birthday present. This not only signifies the festivity of the occasion, but it also converts the overt commodity into a personal possession object prepared by the giver for exchange. Furthermore, the ceremonial aspect of the gift exchange was heighten by the set-up of the movie scene which established the tone and ambiance for the occasion, which was then reinforced by the personalized, handmade birthday card presentation. Another mode of appropriation manifests in the act of shopping for the object. Shopping, as a cultural activity is an economic activity and in this case, a labour of love. By researching WWI compasses and sleuthing out an appropriate compass dealer, negotiating a price and transacting the sale, I not only worked directly on acquiring the object, I symbolically worked on the object—making it my personal possession. By selecting and shopping specifically for an item that was highly meaningful to my wife and symbolic of the relationship between us, the gift was embodied as a personal possession of mine and thus, successfully transformed from an anonymous commodity into a personal gift. To summarize, this essay shows how an object—in this case a WWI Verner's Pattern prismatic compass—has a cultural biography. By following an object's social history as a commodity, I have illustrated how it moves in and out of various commodity phases based on the regimes of value that are ascribed to it. Furthermore, I have shown how people have used and transacted this cultural object as a commodity to create and recreate social identity and relationships, thus showing that it is the subjective ascribed values of the buyer/giver and seller/receiver that determines the social trajectory of any given cultural object. Allouche, Mohamad Khaled 2013. The Boreal Arrow. http://www.borealarrow.com/index.htm accessed February 16, 2014. London Evening Standard 2006. Lawrence of Arabia's £1/4m compass 'is a £50 fake'. http://www.standard.co.uk/news/lawrence-of-arabias-14m-compass-is-a-50-fake-7285211.html accessed February 16, 2014. Takacs, Kornelia 2010. Compass Chronicles. Schiffer Publishing Ltd., Pennsylvannia USA.